The close relationship between SACD technology and small independent record labels has repeatedly proved to be of mutual benefit in recent years. Many labels have been able to capitalise on niche audiophile markets through a conspicuous emphasis on sound quality, while their A&R teams nab the top talent that was once the preserve of the major internationals. But sometimes the results don’t quite meet the heightened expectations, and in the case of this Tchaikovsky 5, I suspect financial considerations have let the project down. 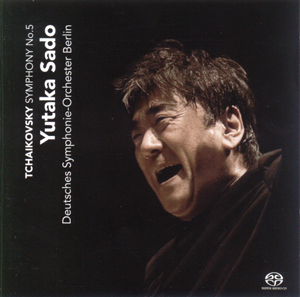 The Deutsches Symphonie Orchester Berlin is a fine ensemble, even by German standards. Their home is the Philharmonie, surely the finest recording venue in the city. Why, then, was this recorded in the Jesus-Christus-Kirche, one of Berlin’s larger protestant churches? There is no untoward reverberation to the acoustic, but the recorded sound is muddy and indistinct. Perhaps without the SACD layer this would be less of an issue, but from an audio point of view, it’s a wasted opportunity, especially considering the quality of the orchestral playing: the unity of the string sound, the distinctively toned woodwind and horn solos. And there are details of the orchestration – contrapuntal lines, PP answering phrases – that are all but inaudible, a great shame. I’m not a fan of Sado’s interpretation either. He is good in the quiet passages, the clarinet opening, for example, and the horn solo at the start of the second movement. But elsewhere much is lacking. The climaxes lack urgency, the third movement Valse lacks grace and the finale lacks momentum. In many places, these issues are clearly the result of conscious interpretive decisions. He obviously has no desire to emulate Mravrinsky’s furioso intensity in the finale and presents the movement as something altogether more civilised. So the motif of a dotted crotchet followed by two semiquavers that recurs throughout the work loses its doom-laden menace as a harbinger of fate and becomes instead an innocuous idée fixe. Perhaps, then, it is to the orchestra’s credit that they provide such a coherent realisation of Sado’s ideas. And the orchestral playing really is impeccable. The opening of the Slavonic March (didn’t that work used to have a French name?) is another quiet passage where Sado conjures some real atmosphere. But again the following tuttis all fall flat. Tchaikovsky is quite modest in his notated articulations in these two scores, but more are required than are stated for a successful performance, and without them the results are monotonous. All things considered, I would struggle to recommend this recording. There are already a good many Tchaikovsky 5s out there, and at least half a dozen on SACD. That’s probably to be expected; it’s the sort of work that could really show off the technology. Sadly, it fails to on this occasion.